data. 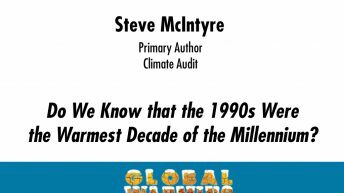 He is most prominent as a critic of the temperature record of the past 1,000 years, particularly the work of Michael E. Mann, and the data quality of NASA’s Goddard Institute for Space Studies. McIntyre has worked in hard-rock mineral exploration for 30 years, much of that time as an officer or director of several public mineral exploration companies. 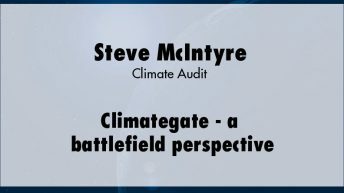 He has also been a policy analyst at both the governments of Ontario and of Canada. With Ross McKitrick, McIntyre has been involved in questioning the validity of the “hockey stick” graph used in a journal article by Michael E. Mann and co-authors.